What can I say about the Magewrath Throne that it not immediately apparent from simply looking at it? Not much. It’s properly absurd. A twenty-first century musical performer on a Magewrath Throne recently. It is an arena musical performance stage prop. It is a 90s arcade game boss damage soak (he jumps off the throne at the end, obvs). It is an amusing thing to put toy soldiers on. I really like your take on this. It’s very colourful without looking (too) ridiculous. I like your use of the tufts to help give it more time-weight. I’ve noticed that these GW kits are designed very cleverly with drybrushing in mind – the sharp edges on the outermost stones are very crisp so they end up highlighted in a way that basic texture doesn’t. It’s something other terrain manufacturers aren’t as canny to fo. What kind of evil overlord lets tufts grow on his throne? Don’t they have goblins or something to pick those? But yeah it’s great. Very over-the-top! I mean, not just ONE tier of gigantic skulls underneath… nope. Ignoring the cushion for a moment Allison, I tend to see these things as like monuments or some sort of outdoor, civic instruments. While a royal may have been perched on that Throne may at some point, I don’t think that this one was his or her day to day seat of office. As for the cushion, I suspect it either pops up, like a bus or old style cinema seat, or perhaps rotates, to keep the cushion in good shape. I considered painting the cushion like stone, like a statue of a seat, but I reckoned that it may raise even more questions that way. As for the pillar of gigantic skulls, I think that they are collapsible, decending telescopically to lower the seat to the ground for boarding. I mean, how else would people get their Magewrath on? Whether the aesthetic appeals or not, modern GW kits are very refined. The Throne isn’t even terribly recent, but as you say, the model has incorporated ways of painting it into its design. I used the same palette on the Throne as I did on the rest of the EXACTAMUNDO items. Its reasonably subdued, which makes the OTT elements a little more plausible while also featuring cartoony style brickwork in places to stop it from being too monotonous. A lovely piece of over the top terrain. Makes me want to build the emperors throne. In space. It’s properly over the top all right Sean. 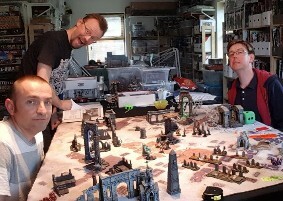 It might be the most ridiculous piece of terrain that I have, but, as long term readers will know, I have embraced this particular part of my miniature part of mid-life crisis. At least its not a sea going vessel that I can’t afford or similar. A Golden Throne project could be a fun diorama. I tend to only work on projects with gaming applications, but maybe there could be an angle. What I want to know is how the hell do you get up to the throne from ground level? Part Mariah Carey stage show, part Masters of the Universe playset, all proto AoS. I reckon that the the pillar piece either concertinas to ground level or else descends into a pillar shaped recess to facilitate access, like the hydraulics on a bus. Or else magic. It is a throne on a giant pillar of skulls after all. I can’t help but wonder if the throne makes wizards wrathful, or if it turns angry people into mages? It’s a bizarre bit of kit – I have had one undercoated for a year now & really must get around to doing something with it! “Constructed in an ancient time by powerful and insane wizards, these might edifices are highly sought after. A warlord who takes such a throne of power can use the magic imbued within it to wreak wrath and ruin upon his enemies”. So the answer is “B”, it turns angry people into mages. The rules back this up, it doesn’t buff irascible mages. It’s a relief to be able to clear that up. 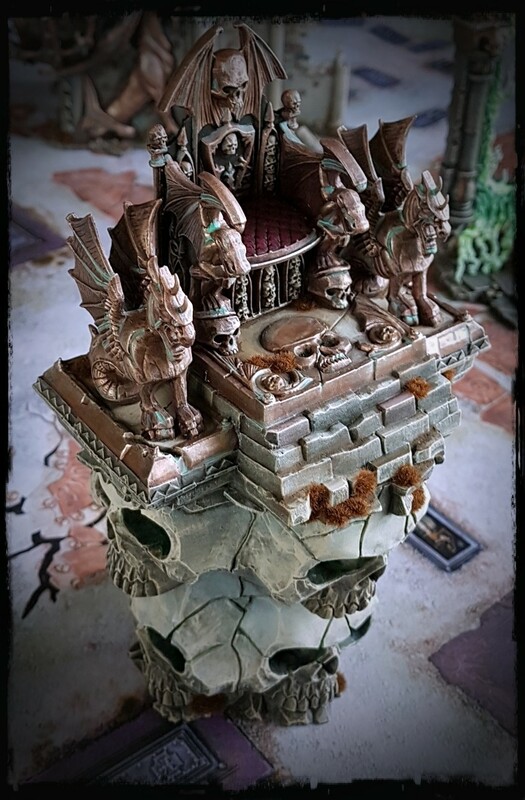 As for painting yours the throne always going to be a difficult piece to integrate into a terrain set. I made an effort to integrate mine into EXACTAMUNDO, but there is at least as much reason to go full disco when painting it. I’m certain that you will knock it out of the park anyway Alex. I mean really, what more needs to be said. I imagine Rodney James Dio rolling onto stage circa 1983. It’s the sort of throne a Master Necromancer from humble serf beginnings would have built for himself just past the zenith of his power. Superbly done up as usual. I think that we are seeing eye to eye on this Subedai! Looks great! I’ve got one of these myself that I bought recently (last year is still recently), but it lacks the tower of skulls and is instead just the chair with bling. Yours, rather more impressively has all of the skulls! I bought the Storm of Magic fulcrums a in 2015 or so, around the time that I painted the AoS Realmgates. The reissued Throne (Xmas 2016 IIRC) didn’t feature the skull tower. The tower is completely daft of course, but by the time we are in the realm of Magewrath Thrones I feel that you might as well go up to eleven. 2005 me cant believe that 2018 me is typing this, but I do prefer the model with the tower. Its a daft thing, but I have already had a few laughs simply by sitting the ludicrous object on the table, so its worth some of your time I think. It looks magnificent with that paintjob, obviously, but when you have such an over the top piece, your only choice is… to build an over the top fortress around the throne for the over the top evil lord to rule the whole over the top land on the board!! I have noted this idea. What can you say about something like that? It’s hilarious, glorious and very much a magic chair perched on top of giant skulls. Great painting on it! Ridiculous and outrageous. I want one. How I scoffed at this thing when it was released. Then later how I trawled the net looking for one. The earthy and dare I say realistic paintjob makes this thing even more hilarious. I love this thing and, indeed, all it’s cah-razy terrain brethren. It’s 100% gold on the table. You get 10% more metal within 6 inches of it. I brayed like an obnoxious schoolboy when the Magewrath Throne was released. It turns out I was wrong and those Citadel designers knew more about me in some respects than I did myself. “Age of Ronnie James Dio” is now officially a thing. Very cool concept. As mentioned over the top, but great piece nevertheless. The painting is top notch, love the verdigris and overall stone coloration. The EXACTAMUNDO set has a sort of washed out Scooby-Doo background vibe to it I think. In some respects it is perhaps a bit silly to try to tone back such absurd terrain pieces with a fairly level headed paint job, but I think the terrain set benefits from it as a whole. I do generally prefer to have my terrain fade into the background compared to the protagonists, but I don’t always manage it. It worked out here though I reckon. I would agree. If you see it as a backdrop painting with more vibrant characters acting in front of it, then the understated paint job works quite well in my opinion. Too vibrant and you may have too much going on, especially with a piece with so much presence. “Presence”, how very diplomatic! Bravo D&B! ;p Unintentional funny word choice. I have a few playlists used when I play AoS. Dio features.